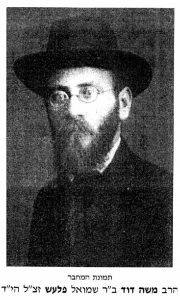 Rabbi Moshe David Flesch (1879-1944) was born in Pressburg and studied there with Simcha Bunim Sofer (the “Shevet Sofer”). He moved to Frankfurt to study with Rabbi Salomon Breuer and became a follower of the teachings of Rabbi Samson Raphael Hirsch. He was appointed rabbi of the Tempel- und Schulverein Stumpergasse (the Stumpergasse Temple and School Association), at 42 Stumpergasse in Vienna. The Stumpergasse synagogue and Talmud Torah school were founded in 1893 as subsidiaries of the better-known Schiffschul synagogue, and was strictly orthodox in orientation. It was at the Stumpfergasse shul that in December 1914 Sarah Schenirer heard Rabbi Flesch deliver the lecture on the biblical heroine Judith that she credited with inspiring her to start the Bais Yaakov schools. She later regularly attended his lectures and classes at the synagogue, which introduced her to the thought of Samson Raphael Hirsch—Hirsch’s writings would become enormously influential in Bais Yaakov. Vienna, too, would play a role in Bais Yaakov: The central office of the Agudah’s educational foundation, Keren Hatorah, was directed from Vienna by Rabbi Dr. Leo Deutschlander, and the city saw its first Bais Yaakov school in 1920 and first teachers’ seminary in 1930. Rabbi Flesch took pride in his role in the founding of the school, and visited the school system in Poland in the interwar period. On the morning of November 10, 1938, the Stumpergasse synagogue was set ablaze and destroyed. Rabbi Flesch was arrested and expelled from Austria. The Flesch family fled to the Netherlands, but he was arrested there in 1943 and deported first to Westerbork, and then to Buchenwald, where he died in 1944 from hunger and exhaustion. A selection of his teachings on the weekly Torah portion, Metukim me-dvash, was edited by Shlomo Loewenthal and published in 2004.